Vintage - Staffordshire Old Granite "Fruit Sampler" Pattern, (older pattern), England, Produced in 1974 to 1982 by Johnson Bros China. Total of (22) Pieces. A Service for (4) Four, with additional Pieces. (See our matching China Dinnerware Set also). 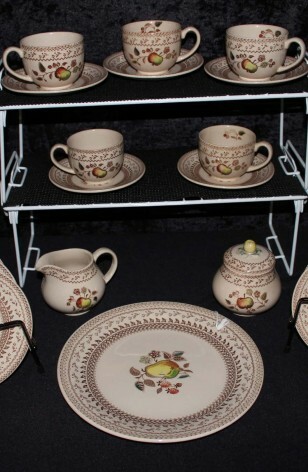 This is a Tea Set in the "Fruit Sampler" (older) Pattern, Made in Staffordshire, England in the Old Granite Line by Johnson Bros. Hand Engraved Design, Under Glaze. Beige Under Color with Center Design of Different Fruits, surrounded by Brown Verge and Brown Designs on Lip. Cups have both an Inside and Outside Design. 6 - Bread/Dessert/Tea Plates - 6 3/8"
2 - Fruit Bowls - 5 1/4"
1 - Cookie Platter - 12"